The firm's strength lies with our skilled & experienced technocratic team that has passion, possesses sound knowledge and vast experience but for challenges, continuous improvement, and excellence of electric. We are technically expert in oil field sectors and desert areas. We particularly value believe in integrity and value people and the environment. 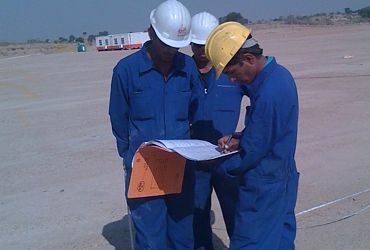 We have permanent well-qualified and experienced Management staff, (Electrical, Instrumentation and Mechanical) Engineers, Supervisors (C Mine License Holder), Foremen, Skilled Technicians, Approved Cable Jointers from 3M and Raychem, Unskilled Technicians, Fitters, Welders and helpers and Unskilled labor. We increase team as on requirement in our project division. We have adequate machines, tools & tackles and testing equipment.